Andy: I’ve had worse, and I’ve had better. It’s better than Havana Club and Bacardi by far, but not as good as Clement. It does have a pretty strong burn to it but when mixing with Diet Coke, the burn almost disappears and only the rum flavor remains. 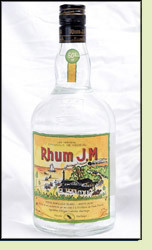 Adrian: Rhum JM has burn. It has a decent flavor straight, but the burn was there. This rum is slightly over-proof and makes an excellent mixer. Would be a good option to kick up a drink.